London: The Photography of Christina Broom – Christina Broom is regarded as the UK’s first female press photographer. With creativity and a bold pioneering spirit she took her camera to the streets and captured thousands of images of people and events in London, revealing unique observations of the city at the start of the 20th century. One hundred years later, a major new exhibition of her works at the Museum of London Docklands reveals the extraordinary story of this self-taught novice who turned photography into a business venture to support her family. 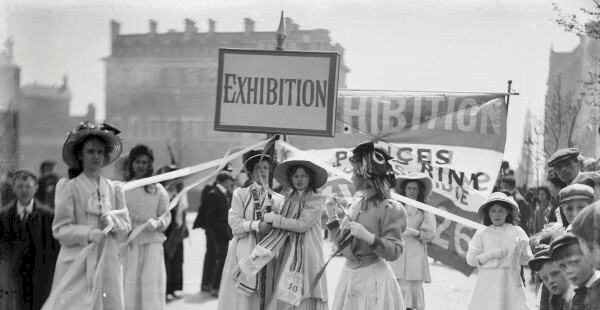 Showcasing many images never seen before on public display, this is the first ever exhibition dedicated solely to Broom, featuring prints and original glass plate negatives, as well as the picture postcards of London that brought her substantial commercial success until her death in 1939. From parades of First World War soldiers and Suffragette processions to royal occasions and sporting events, view life in London through the lens of Christina Broom.